If you find yourself in the Midwest, there's a pretty good chance you won't need to look too hard to find a farmers market during the summer season. In rural and urban areas alike, these marketplaces are generally a fixture of the community, whether they pop up in parking lots or park pavilions on the weekend or if they have a more permanent location with fairly regular hours. That latter characterization describes one such farmers market that has been in operation in midtown Grand Rapids for nearly 100 years. One of about 20 farmers markets to open across the state of Michigan in the early 1920s — and one of the only ones from that time period still operating in its original space and configuration — the Fulton Street Farmers Market has endured in the Midtown neighborhood of Grand Rapids for 96 years, celebrating locally-grown food, Michigan farmers, and weaving itself into the fabric of the community. Vendors at the Fulton Street market, of which there are many, typically offer the usual paraphernalia: fruits, vegetables, meat, dairy products, flowers and other potted plants, and handcrafted items, such as soap. Some of the vendors I saw when I stopped by on a recent Wednesday included Visser Farms, out of Zeeland; Nyblad Orchards and Earthkeeper Farm, both from Kent City; and Jen's Cookie Jar, a bakery located in Grand Rapids. The market hosts around 200 different businesses during a given season, and, since 2011, is actually open year-round, making it unique in the region. While the primary season runs from May through Christmas, the Winter Market, which makes use of the Market Building that was constructed in 2012, is in operation from January through April on Saturdays. Though space in the Market Building is limited, meaning only a handful of vendors can offer their wares on a given Saturday in those winter months, the added hours of operation are certainly a boon to farmers and community members alike. Whilst perusing the produce and other items on offer during my recent visit to the market, I bumped into a gentleman named Darryl who claimed to be a regular. We exchanged pleasantries, shared little ditties about ourselves, and eventually ended up diving deep into a conversation about farming labor practices and migrant farm workers — but before we got into that, he had one piece of advice to share with me about the market: come during the week. Saturdays can get a bit hectic, Darryl told me, but on Tuesdays, Wednesdays, and Fridays, one is free to roam, capable of hitting every booth they might wish to visit in hardly any time at all and unfettered to such a degree that 10-minute conversations with perfect strangers seem entirely agreeable. Of course, visiting during the week also comes with a built-in caveat, this being the fact that not all vendors choose to make an appearance outside of Saturday. So if you're looking to catch a certain farmer or business, it may be wise to check out their websites beforehand to see what their farmers market schedule is like. 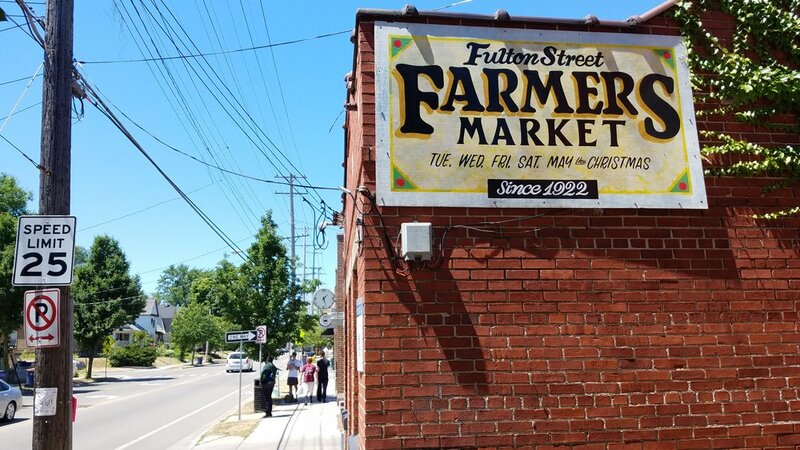 The Fulton Street Farmers Market, for its part, has a list of current vendors published on its site, with links to most of those vendors' own sites or Facebook pages right there waiting for you. And because the folks over at the Midtown Neighborhood Association — the group that has managed the farmers market on Fulton Street since the early 2000s — are so darn nice, they even grouped those vendors by the kind of produce or other item they sell (i.e. fruits, vegetables, baked goods, etc.) so that you can easily find whoever you may be after. Whatever it is you love about farmers markets — supporting local farmers, regularly purchasing homegrown food, the joy of knowing you're being eco-friendly by employing your reusable tote bag, the hustle and bustle of a busy outdoor marketplace on a Saturday afternoon — you'll be sure to find it at Fulton Street. The market isn't Grand Rapid's oldest and largest neighborhood-based farmers market for nothing, after all.